I have got some exciting news to share with you all. The specialized Lithuania catalog is the culmination of many years of research by Antanas Jankauskas. The catalog covers Lithuania 1918-2012, Litwa Srodkowa, Ober-Ost, Memel, local issues (Telsiai, Grodno, Samorząd Warwiszki), WWII German occupation (“June” issues), Displaced persons camp issues, postal stationery, IRC, perfins, postal tariffs, etc. At the end of the catalog the cross reference table is provided for Michel, Stanley Gibbons, Yvert and Scott catalog numbers. Total 496 pages, A4 format. Collectors from the EU can purchase the specialized catalog for 68 EUR (priority registered mail included). Collectors who live outside the EU countries can purchase the catalog for 99.90 USD (registered airmail included). 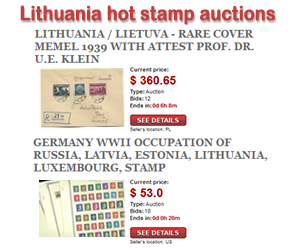 The specialized Lithuania catalog can be ordered on eBay or by contacting Author. Please click on the images below for more details (then click on the enlarging icon in the upper right corner of the picture to enlarge it further). Am unable to access the page where to order the catalogue. tried above link. still doesn’t work for me to order catalog. I wrote to Antanas several days ago for him to email me an invoice for paypal. Hope that works!! Many thanks for your message. I informed Antanas about hosting server outages. ……….very nice, does the book say anything about fakes an forgerys of stamps and letters from this area? No characteristics of specific stamp forgeries are given. There is only a basic notation in the catalog indicating the existence of some forgeries. Have just received your catalogue, and am very surprised how quickly it arrived. Will now go and explore it. I just received this book and it is absolutely stunning, and packed with an amazing amount of detail on a myriad of varieties. Very impressive and well worth the price.